Nimble integrates seamlessly with Office 365 to import the contacts from your address book, track email communication, and stay up to date on your most important events all in one place. 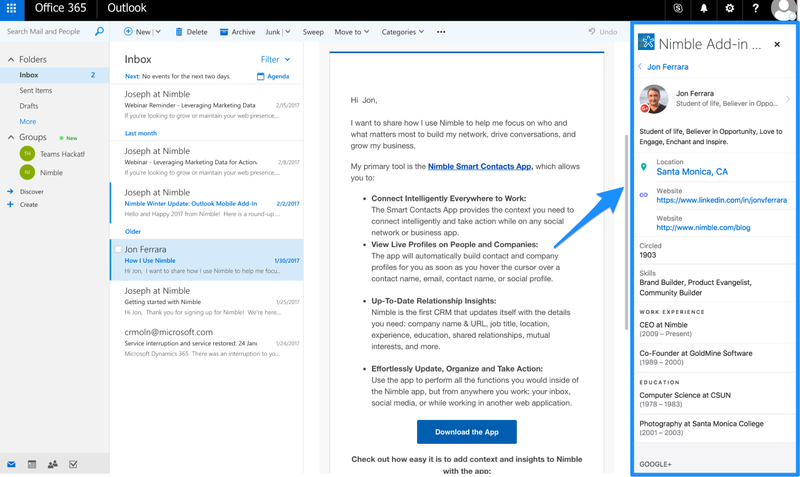 With our Smart Contacts App for Office 365 and Outlook Inbox, you can gather business insights on contacts you are communicating with -- everywhere you work. The app can be used in your Outlook desktop Inbox and online web version. Access all of your Nimble records from your Outlook inbox. Automatic matching of social and public details for contacts & their companies. Instant business and social insights for people and companies in Outlook. Company Insights including: biography, industry, number of employees, year founded, keywords, company type, revenue, ticker, CEO name, business address, and phone number. People insights including: name, company name, title, biography, location, keywords, work experience, education, and social identities. Nimble enables you to connect multiple Office 365 email accounts to track communication with your most important customers and prospects. By connecting your email accounts, you will create a bidirectional sync, enabling you to keep records of past communication, engage directly with your customers from within Nimble, and send targeted group messages to nurture your relationships with potential buyers. Take the steps in this article to set up your Office365 account and start sending individual and group messages within Nimble. Quickly access your most important appointments for the day from the Today Page. Keep records of past, present, and future events on the contact and company records. Create and set recurring events that are visible within Nimble and your Office 365 account. Invite guests to events from within Nimble. In addition to bringing your emails and calendar events to Nimble, we also centralize your Office 365 contacts in one easily accessible location. Add your contacts to start organizing them into targeted list and begin engaging with them more effectively to build stronger relationships. 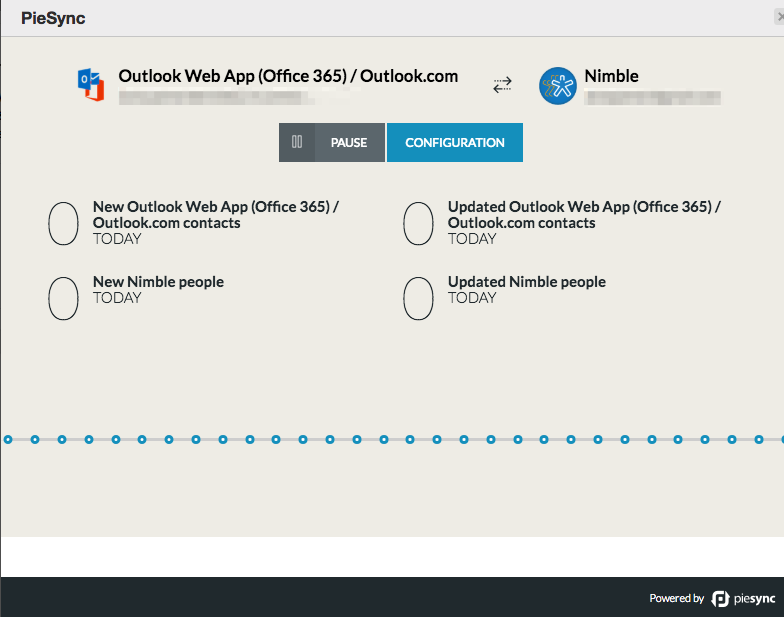 Your Outlook contacts can be added to Nimble from Settings >> Networks & Imports, using the "Office 365 Contacts and Group Messages" connector. Once your account is connected, you'll see the option to import contacts. It's important to note that this is a one-way contact sync from Outlook to Nimble. However, we've partnered with PieSync to make the process of creating a two-way sync run as smoothly as possible.